Last weekend, I thought I’ll bike a pleasant flat bike route from home and check out a popular local eatery before a large bike store opened near by. After all, I vaguely wondered if proximity to the bike store, had inspired the restaurant owner to call his café, Cadence Café. Mountain themed print mural. 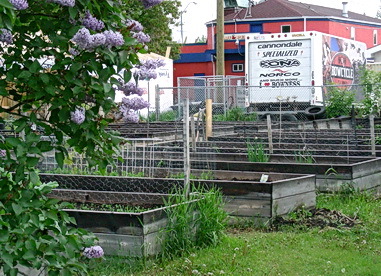 Cadence Cafe, Calgary AB 2012. Photo by J.Chong. Cafe attracted both non-cyclists and cyclists, anyone. number of revolutions per minute. The real test of cadence is sustaining an even, fast cadence when spinning up steep or long hills and mountain sides. It was easy to see why this cafe was a popular place, even on an early Sunday spring morning. It was retrofitted cleanly and smartly in warm, retro 1950’s diner colours of black-white tiled floors and red cushioned seating and accents. The menu was also diverse enough with some reliable muffin flavours as well as some ever-changing breakfast and sandwich selections. 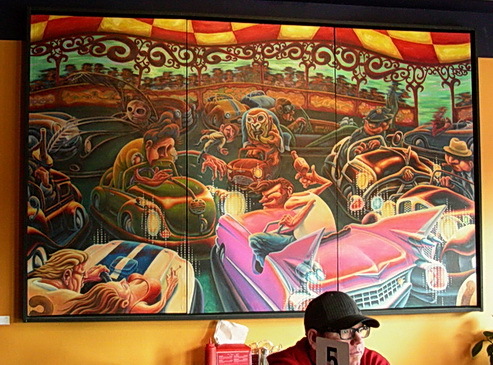 Paintings (or prints) hung around the humming café with two large print murals at each end. One of them was a fun, casual animated scene of cars and comical drivers. A rather jarring contrast to the café’s namesake. As I seated myself, I spotted to the far left, and nearly hidden beside a Canada Dry pop cooler, an old rusted bike handlebar set on top of its stem and wheel fork. 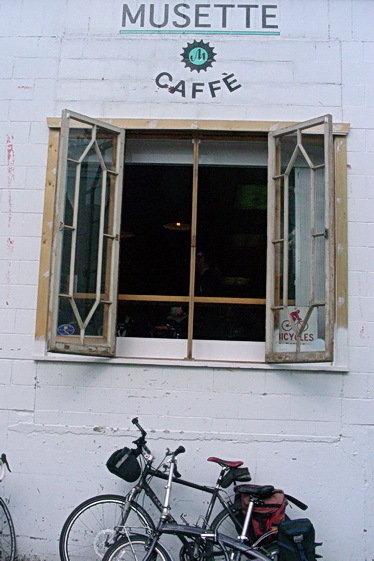 There were other clues of past attempts to decorate the premises with cycling memorbilia. In the women’s washroom, on the wall, there was a 15-20 year old print of a cycling peleton with (male) cyclists a la Tour de France style. Honest, they should have thrown the print away. Although the café drew cyclists, there were also convivial crowds of families, children and retirees lining up for their food and kibbutzing around the tables. Cadence Café found the right formula by disregarding its homage to cycling, by appealing to people from all walks of life. affection to the world. Its name is derived from “musette”, a sac of portable food to refuel competing cyclists in a long race. Musette Café became a local news media darling when it first opened by an alley near Burrard St., not far from the Burrard Bridge. The cycling community welcomed a local business that overtly courted cyclists. In contrast, there were prolonged public protests in Vancouver and debate between cycling community and other downtown businesses and retailers located along the recently installed separated bike lanes on Burrard Bridge, Dunsmuir and Hornby Streets. The protesting and debates peppered the news for months. Several businesses claimed they would lose customers because valuable side parking spots would be lost. Months later, after all the sturm and drang, the local Board of Trade has quietly offered that they would help find more appropriate businesses near the separated bike lanes. I decided to check out Musette Café for myself. 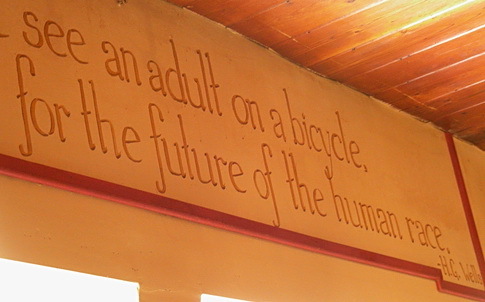 Indeed, the café’s brainchild must be a compeitive road cycling aficionado. 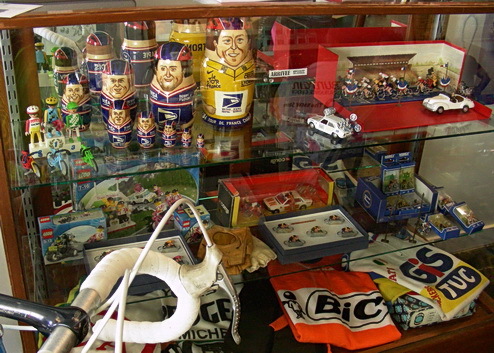 The small café is adorned with enough cycling memorabilia and knick-knacks. It is a wonderful place just to see a personal collection of memorabilia. Clearly any experienced cyclist who loved bicycles could relate to some of the cycling collectibles. However, most of the adornment pointed to the cycling racing world, not to the general bicycling folks who may cycle in walking shorts, a skirt or sneakers. When I dropped by, there were cyclists relaxing with their coffee and muffins in their cycling gear. Outside there were a few expensive bikes, meaning brand models. I am not certain if this café is drawing regular streams of customers, or if most of their customers are cyclists. Let’s hope that cyclists with their fixie bikes, swirly skirts and bike baskets are also dropping by often enough. Popular bakery with locals and tourists. Cowichan Bay, Vancouver Island 2006. Photo by J. Chong. Located in the core of this seaside town along a harbour. 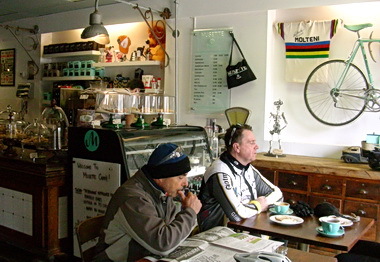 But more to the point, do non-cyclists come back to this café with its overt cycling theme in its decor? Perhaps, look at it this way: there a few bars in downtown Toronto and elsewhere that have a strong hockey theme. Hockey is a Canadian obsession but it’s not the only sport that consumes some folks. Would I go to a hockey pub and enjoy it? Well, other than the fact I don’t drink beer (but I drink wine), I would drop by, at least for curiosity and with some friends. reason –a suggestion by another friend or the pub offered some unique or fantastic pub food dishes. Normally, I’d rather sit in a restaurant for a lovely meal and nurse my own glass of wine without an overhead television blaring away. 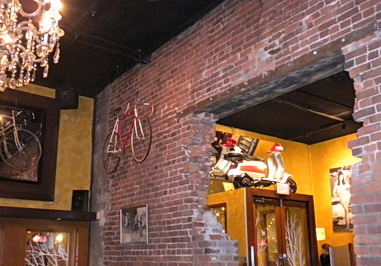 Bike decoration just part of ambience for an Italian cuisine restaurant. Victoria, BC 2009. Photo by J. Chong. A suggestion of the Giro d’Italia bike racing culture. Cycling enthusiasts can know of different cycling subcultures that can exist –skinny tire roadies, fixie bike hipsters, bike commuters, recumbent cyclists and the whole mishmash of all cyclists at major public cycling events. However just because a person is a bicyclist, it doesn’t mean they feel instant camaderie with competitive cyclists or other cycling folk from other cycling subcultures. Cycling enthusiasts might consider particular bikes as a work of art. But honest, bikes without any other adornment, are utilitarian to many non-cyclists. It’s a vehicle that becomes animated with a cyclist and bike accessory bling. So Musette Café might be a rare visit for even a regular cyclist who shuns the image of cycling jersey, helmet, cycling shoes and clipless pedals. But I hope not, or at least may be Musette might transform itself for everyone, despite its cycling personae. It sounds like you had a nice ride, what a nice way to start off a weekend morning! Let us know how both restaurants fare as time passes, hopefully they can both become permanent fixtures in your community. I wish that we had a similar restaurant but as of now that wouldn’t work here. 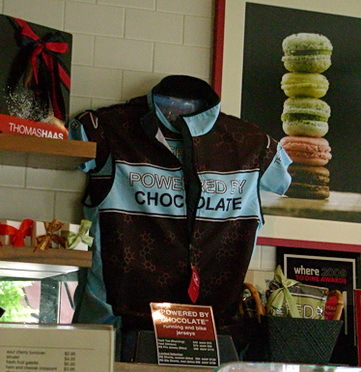 Cadence Cafe is a favourite magnet for locals and those who choose it as a cycling destination. Since it is at the end of a flat bike route, there is a wide variety of cyclists that may drop by. Plus pedestrians from neighbourhood and drivers. Don’t know about Musette Cafe. We’ll see. 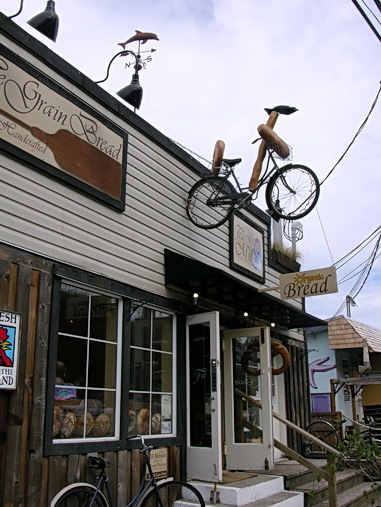 And the bakery with the bicycle mounted above its entrance with baguette in basket, is popular with locals and tourists. It’s not just cyclists. Lynn, people cycling should be considered ordinary like how you have viewed it all along…just part of ordinary daily travel. Nothing wierd. But many areas of North America still consider cycling child’s play and a lower form of transportation. As for subcultures in the cycling community: absolutely, but in a different way from music community. I’m not sure if there are subcultures for hockey. Certainly there would be for: skiing, jogging, hiking. Human beings like to find kinship and identity for solitary passions/activities at times. I never thought of cadence as related to music, but absolutely another “spin” 🙂 on the name of Cadence Cafe. Or combine music and cycling passions. 🙂 This cafe occasionally does have local musicians. Your biggest fan appauds yet another fascinating blog post on “wheels”. Bicycling is big in B.C. and that makes all of us nature lovers smile. If I could ride a bike I would, but I can’t and I won’t be spending thousands on a trike. That said, many people I know are cyclists so I suppose they are part of “the bike culture”. I haven’t been to Cowichan Bay and visited the bakery for many years. I’ve never been to either the Musette or Cadence Cafes and really appreciated viewing your photos of them. 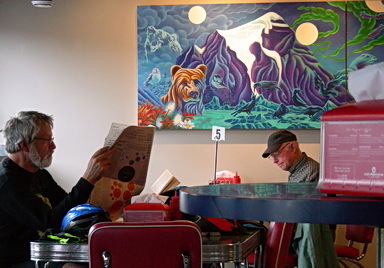 The bicycling memorbilia and collectibles at Musette Cafe are wonderful and the Cadence Cafe murals are fabulous. But you didn’t say very much about the food so I assume it was okay but not oustanding at either cafe. One doesn’t need to spend alot of money on a bike. Large North American cities often have a non-profit community bike organization that refurbishes used bikes. Or the local police have annual bike auction to get rid of impounded, unclaimed bikes that were stolen However a trike would be expensive now. But later, there may be a greater demand as cyclists age and refuse to give into sedentary habits/non-cycling. Musette’s food choices were to fuel people just muffins, etc. Cadence offers sandwiches. But yes, not innovative, memorable food. However the Cowichan Bay bakery has some good baked goods selections. Now, the exterior is festooned more wildly with bikes and handlebar baskets filled with blooming flowers. I’ll be inserting a photo later soon…after returning from a bike ride. I don’t bike regularly, but I consider myself a nature lover. It’s great to find these cycle-themed eateries, which gives your dining experience a whole new dimension. Just wonder if you live to any of them. I’m sure Shanghai has some interesting theme restaurants. 🙂 In Shanghai there is an active fixie bike community (people who like to ride on one-speed bikes) http://peoplesbike.com/pplsen/ I’m not really into the “fashion” of cycling. I just like bikes that fit me, help me cycle comfortably and well. I have lived near some of the featured restaurants while others I have to bike at least 12 km. one-way to get there. Victoria on Vancouver Island is most definitely accessible by a lovely 2 hr. long ferry ride from Vancouver area and same with Cowichan Bay area. This is nice place to stop by, and the photos are so nice! With all the bikes hanging in the restaurants…I would loved to visit this place! What kinds of themed restaurants would be at your end of the world? I only notice certain details because I bike alot. p.s. and I don’t bike…. Never say never. Most people end up choosing the wrong bike size or are pushing too high of gears. When this happens, cycling is not comfortable. You just need to be with an experienced cyclist for 1-2 rides with right bike, etc. So you must drive or walk alot in Croatia. I live in London and for the city we use the “Boris bikes” have you heard of those? Boris Johnson is the London Mayor and he introduced thousand of bikes and bike stands all over the city. Which is quite good to get people off their cars, and do some exercise. And in Croatia? yes I walk to the beach or to the shops. But further afield we hire a car, as we are renovating our holiday home there and often go and buy plants, heavy items for the house etc. etc.